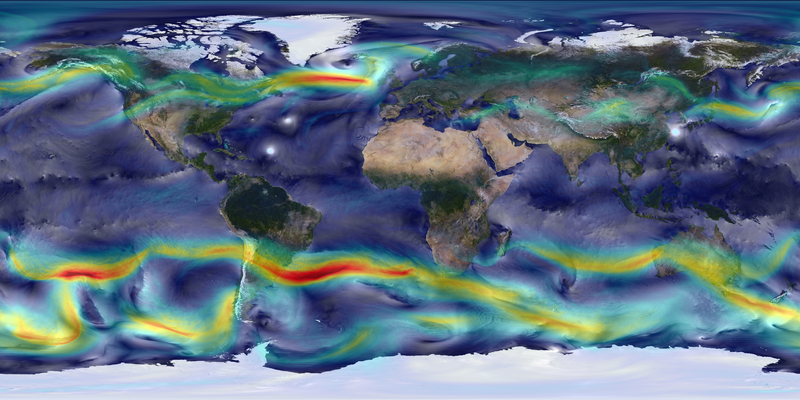 High-resolution global atmospheric modeling provides a unique tool to study the role of weather within Earth’s climate system. NASA’s Goddard Earth Observing System Model (GEOS-5) is capable of simulating worldwide weather at resolutions as fine as 3.5 kilometers. 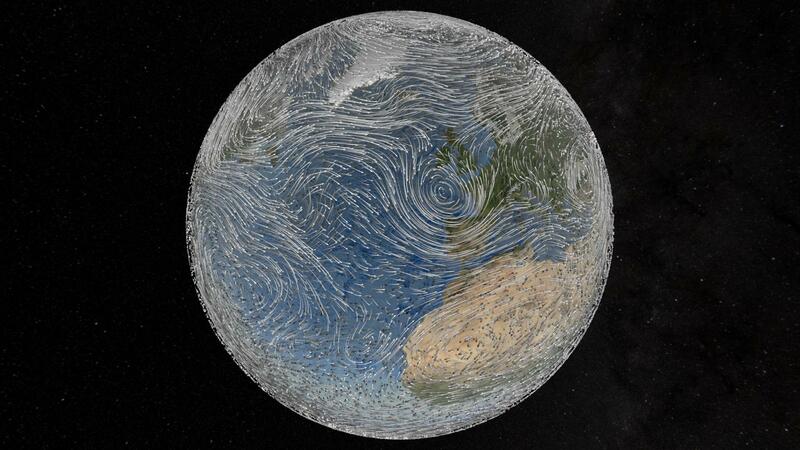 This visualization shows global winds from a GEOS-5 simulation using 10-kilometer resolution. Surface winds (0 to 40 meters/second) are shown in white and trace features including Atlantic and Pacific cyclones. Upper-level winds (250 hectopascals) are colored by speed (0 to 175 meters/second), with red indicating faster. This simulation ran on the Discover supercomputer at the NASA Center for Climate Simulation. and surface emissions from biomass burning, volcanoes and anthropogenic sources—produces its own unique weather patterns including precipitation, aerosols and hurricanes. A follow-on Nature Run is simulating Earth’s atmosphere at 7 kilometers for 2 years and 3.5 kilometers for 3 months. Built with spare parts and without a moment to spare, the International Space Station (ISS)-RapidScat isn't your average NASA Earth science mission. Short for Rapid Scatterometer, ISS-RapidScat will monitor ocean winds from the vantage point of the space station . It will join a handful of other satellite scatterometer missions that make essential measurements used to support weather and marine forecasting, including the tracking of storms and hurricanes. It will also help improve our understanding of how interactions between Earth's ocean and atmosphere influence our climate. 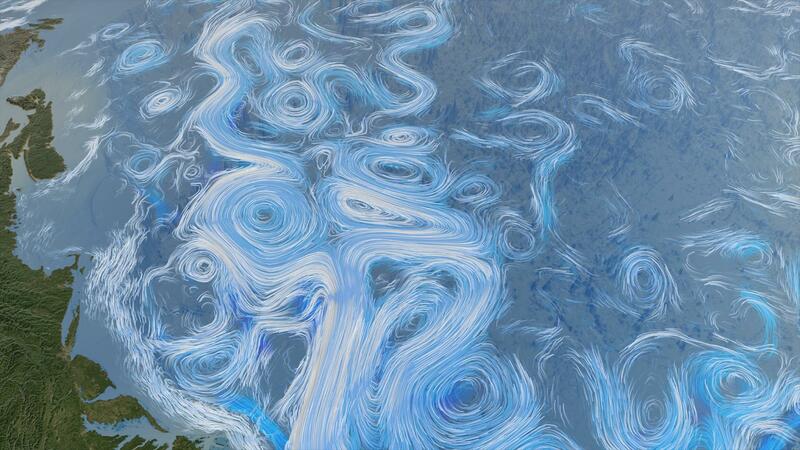 Scientists study ocean winds for a variety of reasons. Winds over the ocean are an important part of weather systems, and in severe storms such as hurricanes they can inflict major damage. Ocean storms drive coastal surges, which are a significant hazard for populations. At the same time, by driving warm surface ocean water away from the coast, ocean winds cause nutrient-rich deep water to well up, providing a major source of food for coastal fisheries. Changes in ocean wind also help us monitor large-scale changes in Earth's climate, such as El Niño . Scatterometers work by safely bouncing low-energy microwaves - the same kind used at high energy to warm up food in your kitchen - off the surface of Earth. In this case, the surface is not land, but the ocean. By measuring the strength and direction of the microwave echo, ISS-RapidScat will be able to determine how fast, and in what direction, ocean winds are blowing. "Microwave energy emitted by a radar instrument is reflected back to the radar more strongly when the surface it illuminates is rougher," explains Ernesto Rodríguez, principal investigator for ISS-RapidScat at NASA's Jet Propulsion Laboratory, Pasadena, Calif.
"When wind blows over water, it causes waves to develop along the direction of wind. The stronger the wind, the larger the waves." ISS-RapidScat continues a legacy of measuring ocean winds from space that began in 1978 with the launch of NASA's SeaSat satellite. Most recently, NASA's QuikScat scatterometer, which launched in 1999, gave us a dynamic picture of the world's ocean winds. But when QuikScat lost its ability to produce ocean wind measurements in 2009, science suffered from the loss of the data. In the summer of 2012, an opportunity arose to fly a scatterometer instrument on the space station. ISS-RapidScat was the result . Most scatterometer-carrying satellites fly in what's called a sun-synchronous orbit around Earth. In other words, they cross Earth's equator at the same local time every orbit. The space station, however, will carry the ISS-RapidScat in a non-sun-synchronous orbit. This means the instrument will see different parts of the planet at different times of day, making measurements in the same spot within less than an hour before or after another instrument makes its own observations. These all-hour measurements will allow ISS-RapidScat to pick up the effects of the sun on ocean winds as the day progresses. In addition, the space station's coverage over the tropics means that ISS-RapidScat will offer extra tracking of storms that may develop into hurricanes or other tropical cyclones. Artist's rendering of NASA's ISS-RapidScat instrument (inset), which will launch to the International Space Station in 2014 to measure ocean surface wind speed and direction and help improve weather forecasts, including hurricane monitoring. It will be installed on the end of the station's Columbus laboratory. "We'll be able to see how wind speed changes with the time of day," said Rodríguez. "ISS-RapidScat will link together all previous and current scatterometer missions, providing us with a more complete picture of how ocean winds change. Combined with data from the European ASCAT scatterometer mission, we'll be able to observe 90 percent of Earth's surface at least once a day, and in many places, several times a day." ISS-RapidScat's near-global coverage of Earth's ocean -- within the space station's orbit inclination of 51.6 degrees north and south of the equator -- will make it an important tool for scientists who observe and predict Earth's weather. "Frequent observations of the winds over the ocean are used by meteorologists to improve weather and hurricane forecasts and by the operational weather communities to improve numerical weather models," said Rodríguez. Space-based scatterometer instruments have been built before, but much of what makes ISS-RapidScat unusual is how it came to be. "Space Station Program Manager Michael Suffredini offered us a mounting location on the space station and a free ride on a SpaceX Dragon cargo resupply mission launching in early 2014," explained Howard Eisen, the ISS-RapidScat project manager at JPL. "So we had about 18 months to put together an entire mission." This accelerated timeline is a blink of an eye at NASA, where the typical project is years or decades in the making. Next, Eisen and his team turned to getting creative and crafty with the mission's hardware. In lieu of using newly-designed instruments, which would be expensive and take too long to develop, ISS-RapidScat reuses leftover hardware originally built to test parts of the QuikScat mission. That process involved dusting off and testing pieces of equipment that hadn't seen the light of day since the 1990s. Fortunately the old hardware seems ship-shape and ready to go. "Even though they were spares, they've done an excellent job so far," said Simon Collins,ISS-RapidScat's instrument manager at JPL. Despite their age, the old parts are more than capable of collecting the ocean wind data that ISS-RapidScat need to be a success. In addition to old spare parts, some new hardware was needed to interface this instrument to the space station and the Dragon spacecraft. ISS-RapidScat will use off-the-shelf, commercially-available computer hardware instead of the expensive, hardened-against-radiation computer chips that are typically used in space missions. "If there's an error or something because of radiation, all we have to do is reset the computer. It's what we call a managed risk," said Eisen. The radiation environment on the space station is much less severe than that experienced en route to Mars, for example, or in more traditional sun-synchronous orbits. This animations is a collection of beauty shots of cloud model output over Africa, Europe, Australia, North America, Florida, South America and Antarctica. The clouds are derived from the Goddard Earth Observing System Model, Version 5 (GEOS-5). GEOS-5 is a system of models integrated using the Earth System Modeling Framework and used to help refine atmospheric weather models. The lighting of this scene is completely artistic and not scientifically accurate. If accurate lighting were used the diurnal effect would pulse across the globe approximately every 90 frames (3 seconds when played at 30 fps). The slow strobing would have been undesireable for the intended purpose of this animation, which is to highlight the cloud model output. Cost-saving decisions like this are shaping up to make ISS-RapidScat an exceptional bargain of a space mission. "We're doing things differently, and we're trying to do them quickly and cheaply," said Eisen. Considering that the typical launch alone can cost $200 million, ISS-RapidScat's estimated $26 million price tag seems like a bargain. Last year, NASA estimated the cost of a new, free-flying scatterometer satellite mission at approximately $400 million. The real challenges of getting ISS-RapidScat into space lie in the details. One of the major headaches of such a hurried schedule has been getting the special connectors that will allow ISS-RapidScat to physically attach to the International Space Station. "They're special robotically-mated connectors that haven't been made in years," Eisen said. "We're having to convince the company that produces these connectors to make us a small run in time for the mission, and it hasn't been easy." The logistics of operating an instrument on the space station are also tricky. "Typically, spacecraft are designed for the instruments they carry," said Collins. "In this case, it's the other way around." For example, ISS-RapidScat's docking point on the space station faces outward toward space - not down toward Earth and the ocean that the instrument is looking at. The space station's flying angle will also change as new pieces are added to it, in response to changes in the station's drag profile. ISS-RapidScat's mount can compensate for both of these challenges. Another concern the ISS-RapidScat team confronted early on was that one of the space station's docking ports lies squarely within the field of view of the scatterometer. "Bombarding astronauts and visiting supply vehicles with microwave radiation from the instruments was out of the question, and turning the instrument off when there were things docked there would take away too much science," explained Collins. The project's engineers instead devised a plan where the instrument avoids irradiating docking vessels, but continues to scan across the vast majority of its viewing range. Rodríguez is confident that the reward for overcoming such difficulties will be a bounty of vital science information. "Because it uses much of the same hardware QuikScat did, ISS-RapidScat will allow us to continue the observations of ocean winds already started," said Rodriguez. "Extending this data record will help us observe and understand weather patterns and improve our preparedness for tropical cyclones."